The global biopharmaceutical logistics market is competitive nature with a large number of players operating worldwide, states a new research report by Transparency Market Research. The competition among the leading players is expected to strengthen a bit throughout the forecast period. Some of the prominent players operating in the global biopharmaceutical logistics market are FedEx Corporation, DHL Express, United Parcel Service, AmerisourceBergen Corporation, and DB Schenker. These players are focusing on enhancing their services to consumers in order to retain their position in the global market. In addition, the rising adoption of innovations and technological developments are estimated to accelerate the growth of the global market and offer promising growth opportunities for the leading players. 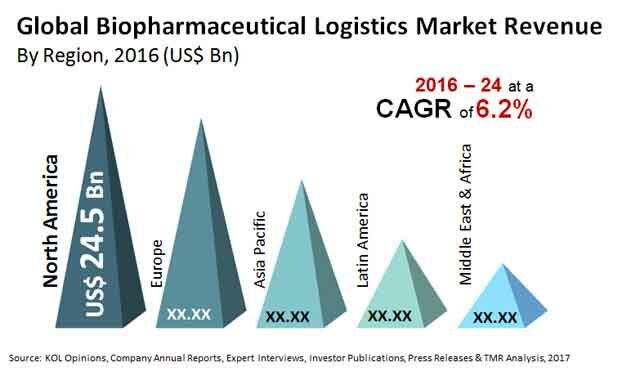 The global market for biopharmaceutical logistics is anticipated to register a progressive 6.20% CAGR between 2016 and 2024. Furthermore, in 2015, the market was valued at US$70.9 bn and is expected to reach a value of US$120.7 bn by the end of 2024. Among the key regional segments, North America and Europe are anticipated to witness high growth throughout the forecast period. The high growth of these regions can be attributed to the increasing number of imports and exports for biopharmaceuticals. In addition, these two regions are the first ones to offer advanced technologies for the enhancement of warehousing and transportation in the supply chain. The presence of leading players in these regions and the willingness to adopt technological developments are some of the other key factors that are anticipated to encourage the growth of the biopharmaceutical logistics market throughout the forecast period. On the basis of mode of transport, the global market for biopharmaceutical logistics has been classified into air shipping, sea shipping, rail shipping, and road shipping. Among these, the air shipping segment is anticipated to register a healthy growth in the forecast period. The high growth of this segment can be attributed to the fast delivery offered by air shipping. On the other hand, the limitations on the volume of transportation by air shipping, the growth opportunities for road shipping, sea shipping, and rail shipping have increased significantly. The rising demand among biotechnology and biopharmaceutical companies to enhance their services and supply chain and further minimize temperature excursions is one of the major factor estimated to encourage the growth of the overall market in the next few years. The advent of advanced refrigeration and packaging has encouraged several logistics organizations to ensure safe transportation of goods. The increased adoption of technologies is estimated to generate promising growth opportunities for the global biopharmaceutical logistics market throughout the forecast period. On the other hand, the high cost of transportation of high-temperature and sensitive biopharmaceuticals is estimated to restrict the growth of the global biopharmaceutical logistics market in the next few years. Nonetheless, the rising production of drugs and targeted therapies is likely to offer potential growth opportunities for the players operating in the market. Global Biopharmaceutical Logistics Market to register healthy growth with rising number of innovations and developments in this field. The increasing production of targeted therapies to boost the demand for biopharmaceutical logistics services.